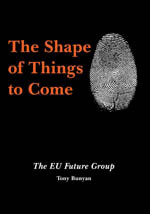 The Shape of Things to Come examines the European Union's plans for justice and home affairs, and warns that the Union is embarked on several highly controversial paths. These include: using the 'digital tsunami' to create a surveillance society for law enforcement purposes by gathering personal details on the everyday lives of everyone living in the European Union; allowing law enforcement and security agencies, in collaboration with multinational companies, to determine new technologies to be introduced - including recording details of all phone and mobile phone calls and internet usage; removing 'obstacles' (judicial authorisation) to the exchange of intelligence between all European Union agencies; and the outrageous idea that a Euro-Atlantic area of co-operation with the United States should be set up to decide on policies fundamentally affecting the rights and liberties of the people of Europe. Also questioned is the undemocratic decision-making procedure under which 27 EU governments will agree the 'Stockholm Programme' that will set in stone the measures to be introduced. The book ends with a warning that, unless we have an open and meaningful debate now, we never will, because it will already be too late.